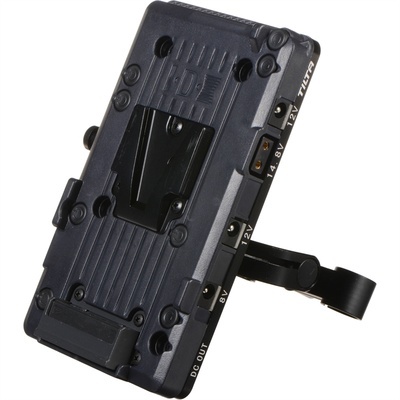 Product #21596 | SKU BT-003-B | 0.0 (no ratings yet) Thanks for your rating! This Tilta Universal Power Supply System from ikan mounts quickly to a 15mm rod system and is designed to provide power to your cameras and other devices while on-the-go. The system features a V-mount battery plate and outputs for 12V, 8V, and 5V coaxial as well as a 14.8V P-Tap port for powering your equipment. Additionally, it utilises an adjustable 15mm rod mount for easily attaching it to your rig. Included with the system are a V-mount battery plate, a 12V adapter cable, and a 5V adapter cable designed to work with the Zoom H4N. Also, a Canon LP-E6 compatible battery adapter is included for powering a camera or accessory as well as a P-Tap to Blackmagic Cinema Camera cable.